I am pretty sure I say this at the end of every single year … but dang it is hard to believe that 2017 is over and we are reporting our dividend income results for December. Overall, 2017 was a fantastic year for building our dividend income stream. Each month of the year we saw growth in our portfolio. It was without a doubt our best year yet for earning (and building) dividend income. In addition to earning a record amount of dividend income, we were able to invest over $12,000 of new money into the stock market. That was less than we had hoped, but still a great accomplishment for our family. When it comes to dividend investing, my favorite month is … December. Not only is it the last month of the calendar year and we have the opportunity to see our yearly dividend totals … it is normally the highest month (or second) of the year for dividend income. Well … guess what? We set an all new monthly dividend income record this past month. In fact, we shattered the old record that we set back in September (2017). Compared to 2016, our dividend income grew by over 66.8% from December of last year! Seriously … that is so awesome! Note – We got a special dividend paid in December by Cincinnati Financial (CINF) which pushed our income totals way past September. Without that special one-time dividend, we would have been about $3 shy of our September record. As mentioned earlier, we saw an increase of almost 67% last month compared to December 2016! That is truly some amazing growth and I am totally pumped going into 2018. Overall, we had 19 stocks pay out a dividend in December. Awesome companies like Aflac, Consolidated Edison, Johnson & Johnson, McDonald’s, and Exxon Mobil gave our family a paycheck for basically not lifting a finger. How cool is that? The first 6 months of 2017, we did a pretty good job investing new money into our taxable dividend stock portfolio. A big part of that was using $5,000+ of our tax return in the spring to invest. The second half of the year we have slowed down a bit on investing new money because of different priorities and have been focusing more on tax deferred accounts. But we still have managed to keep a few investments going in this portfolio. Note – All of these investments were made through our Robinhood, Computershare (XOM), and AmStock (CINF) accounts … which means we did not pay any commissions or fees on these trades. The total amount of new capital invested in December was – $259.43. 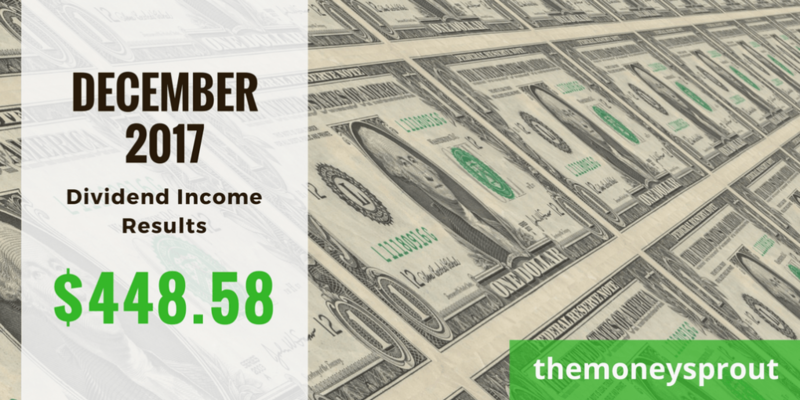 The dividend income earned in December ($448.58) was up over 66% from the same time last year. These increases were from a combination of new investments made, dividend reinvestment’s, and company dividend increases. Our goal for 2017 was to earn $2,400 in dividend income. We beat that target by a ton and earned a total of $2,651.43 in dividends for 2017 … which was $250+ over our original goal. Compared to 2016, we increased our dividend income by $733.27! I would love for a repeat performance of those numbers for 2018. I will be putting together a year in review for our 2017 dividend income post in the future along with a 2018 goals post. Starting in 2018, we also plan to start publishing our tax deferred dividend income results as well. Full Disclosure – At the time of this writing, we owned shares in the following stocks noted in this post – ADM, AFL, BBY, CINF, ED, EMR, HRL, INTC, JNJ, KO, KR, LMT, O, OHI, MCD, MSFT, NSC, TGT, QCOM, UL, and XOM. The material above is not a recommendation to buy. Please do your own research on a company before deciding to invest.